I rarely get knitting gifts even though I am an avid knitter. This year was different. I got the best knitting gift ever. 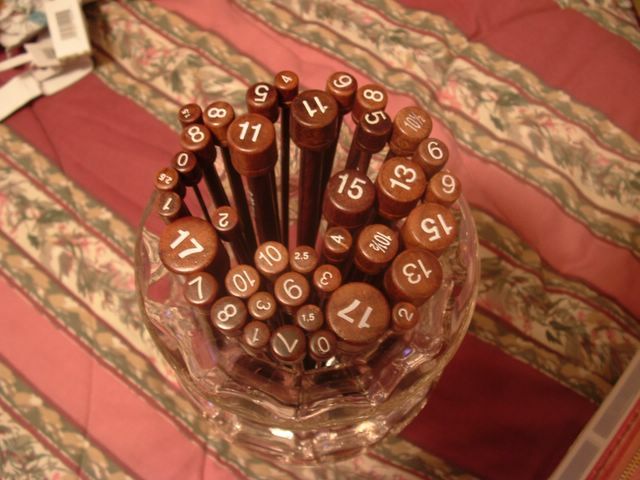 A full set of Colonial Rosewood knitting needles. My mom totally surprised me with this one. The only problem is I'll be afraid to use the smaller sizes, but in the meantime I'll enjoy my needle bouquet. 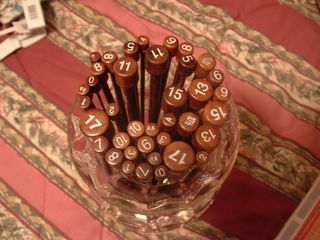 Those size numbers on the knobs are great, my bamboo needles have sizes printed on the needle itself and they wear off. I like the quiet and the slight flexibility the bamboo gives but I have also received the occasional splinter which is painful. I have two pairs of the Colonial needles and they are heavenly! They are so light and smooth. Enjoy yours. What a wonderful gift. We're planning to come to Maureen's sale, so maybe we'll see you soon! I want to come down the first Saturday of the sale. It's just impossible for us to get away on a week day due to work and school. I've just started really getting into knitting. Those needles look amazing, I wish I owned a few! I really do like my metal cheapy needles, though, they're fun to use and I like the noise they make. forgive for the random commenting, but I don't know many people on here :). Have fun knitting! Oh and those maze socks are aMAZEing. haha forgive the pun. Couldn't resist.